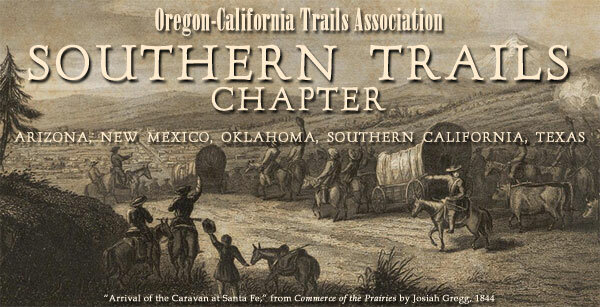 Welcome to the Southern Trails Chapter of the Oregon-California Trails Association. We are a group of amateur and professional historians, researchers, cartographers, and everyday lovers of historic trails. We come from all walks of life, drawn by a common interest – to study and preserve historic trails across the American Southwest. The general term “southern trails” encompasses a network of several early American exploration, trading, and settlement trails leading across the southern states to California. Perhaps the most significant of those trails is the Southern Trail, which was used by thousands of California-bound Americans during the Gold Rush of 1848-1855. In 2009, the Southern Trails Chapter began the long-term project of working to achieve National Historic Trail designation for the Southern Trail. This project has been approved by our parent organization, the Oregon-California Trails Association, the nation’s largest trails organization and a long time leader in promoting and preserving historic trails. If you have an interest in any aspect of historic trails, why not join us? There are many ways you can get involved and make trail history by helping us to preserve the southern trails.